The very attributes that make pastors good at what they do often makes them reluctant to take a vacation. Throw in the fact that vacations can be expensive and it makes it even harder to get away. 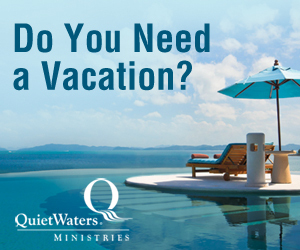 Through a partnership Endless Vacation Rentals and Wyndham Worldwide, Quiet Waters Ministries is able to offer the QuietWaters Pastor Vacation Program. Pastors and missionaries now have the opportunity to experience an affordable vacation getaway and there are 100’s of locations worldwide to choose from. The Resort Vacation Certificate provides one-week of accomodations at the affordable price of just $299 for the entire week! Certificates can be purchased by pastors and used for personal travel or may be purchased as a gift to a pastor. Certificates may also be purchased and used by missionaries (however, you must use a US or Canadian based credit card). Fill out the form below to request an access code. You will need to register on Resort Vacation Certificates’ website in order to purchase a certificate. Purchase the Pastor Vacation Certificate for $299 using the access code received from QuietWaters. You will receive the Vacation Certificate via email. Preview available resorts. You can do this before you purchase the certificate if you want, but remember that availability can change daily. Find the perfect vacation getaway and redeem the certificate. Go enjoy a relaxing vacation getaway! Please complete the information below and we will send you the access code to purchase a Pastor Vacation Program Certificate.